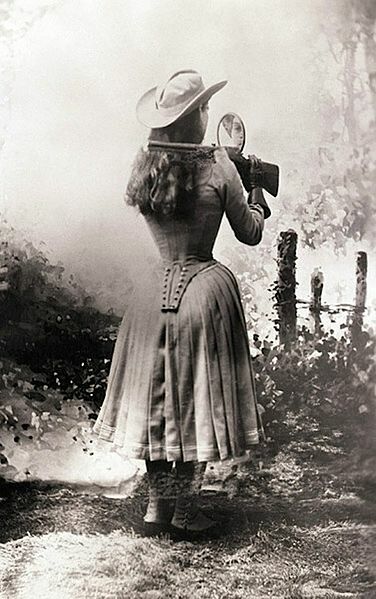 Annie Oakley shooting over her shoulder using a hand mirror. A little to the right to account for earths rotation, slightly up, remember the bullet drop. Wind keeps changing, bit to the left, no, right again. Little more…. Just so. The clicking sound of the trigger ends my excitement. I know what will happen next – my will. My weapon starts roaring, its voice is my herald. Two kilometres to its designated target, my calculations are infallible. The tiny metal orb my Executioner, I, the Goddess of this land and my Will, law. My judgement finds its way. I rest my gun on the left arm, close one eye and await the unnecessary confirmation. 3.742 seconds for my personal Catholicism, the red mist announcing the deed is done. I take my first breath as it takes its last. The adrenaline hits me, I welcome the ecstasy. My right hand, the trigger hand, starts to tremble with the phantom pain it caused, a sort of mea culpa-spasm, an immediate and involuntary atonement of my body. I rub my right with the left, pressing the humour back into the shocked limbs, reviving my hand from its touch of death. I head back to dad and we breakfast. I believed my father when he told me of the border. I adhered to his code as he listed his rules, my rules. “Don’t believe what’s across the border, never take things from the border and never ever cross the border.” Of course, rules can be broken as easily as promises. So, when He brought that thing into our cabin, my trust broke, not just in my eyes but in his codex, in him. It was a strange beast, with a long lashing tail that looked thick and solid, too solid to be organic. The thing smelled, smelled like death. A liquid danger slowly climbing up a kid’s nose. Its fumes spilled anger, a hidden fire burning in its rocklike chest. I only saw the monster once because my father took care of it that night, I think. He later made me my first boomstick out of Its parts. That was before the border took him. A night carved like my weapon, deep into the bone, almost splitting and splicing it. I awoke from a throbbing, pulsating growl that ached as it reverberated against my stomach. It hurt so much I almost puked, but fear of being discovered urged my lips not to part, my voice to hide in the vines of my throat. Had to find father. The Growl came closer, forcing me to press my arms tightly against my tummy to reduce the agony. Then I heard fathers boomstick, First shot “Bang!”, Second shot “Bang!”, then Silence. The scary sound had stopped too. I stayed still, listening. Still, still like a painting for what felt like an eternity. Nothing. Not a single sound, not from father, not from the Growler. Life at the border is lonely. I survived that night, or at least some parts of me did. But ever since then, I felt it moving in the thicket, tracking me, somewhere beyond the screens of green and brown, a pulse that tried to match my own. Father once said: “We are the beasts and whatever lives down there fears us. Our job is to keep it that way.” So, I stayed at the ridge, a guardian at the threshold, asserting my dominance. At least, that was the plan. I got to know what kind of fear he was talking about only after he was gone, because he was gone. Imagine a kid waking from a nightmare after daddy’s bedtime story, refusing to sleep again. For me it was upside down. I dreamt of his stories and refused to wake up. For months I chewed plants that helped me sleep, they brought him back to me for a while. When they stopped working I tried different ones that made me sick enough to stay with him even longer. But then I woke up and something told me I might not be able to do it again. And compared to the ultimate unknown, the Growler was a mere amateur. Hibernation makes you hungry and weak. So, I hunted and gathered. I have never been religious; the hunt provides everything. And my father had tortured me, trained me, named me Artemis for a reason. Yet I found no living thing to kill and eat that morning. At least, until that burning sting in my right leg. When I noticed the snake, it was already halfway curled around my foot, its teeth buried in my flesh. I had to chuckle. Here I was, after almost giving in to the idea of suicide and fighting the resulting death by starvation, a new hide-out every day and this little devil decides to be my end? So, I broke his neck. Then I pulled the teeth out, which he had mockingly left in me, cut a little x in my leg to drain the poison and started feasting on his body. He did not have much blood in him, but it was warm on my lips and felt wonderful as it trickled down my throat. I ate everything but his impotent, toothless head. My body probably prepared for digestion, because I felt my eyelids slowly closing. I lay down completely in the warm puddle forming around me, leaking from the cross I had imprinted in my leg. I saw his grinning head sinking in my blood right as my eyes closed, right before I heard it again. My demon was back. I opened my eyes again, could feel every growl, see their menacing waves in the liquid bed of my self-affliction. My leg was still frozen from the bite, so I had to twist the rest of my drenched body to find the boomstick, now covered in crimson. Another growl, closer… I pushed myself up into a sitting position, inspecting the weapon. It should work… no blood in the barrel, none near the trigger. The third growl hit me like it did back then. My tummy hurt so much… I started crying, Tears washing some of the crusted brown off my face, mixing with the fresher paint of red. I felt like a sacrificial lamb, must’ve looked like it too. Pull yourself together! You are the huntress, not the prey! I readied my gun and aimed in the general direction of the growl. Now we wait. A swarm of flies had already gathered to feast on my sacrifice in a chorus of flapping wings. A moving carpet of grey parts and particles, gnawing, licking and drinking me. They were in a frenzy, a lust for my blood that kept them alive for a few more hours, the only fight that mattered, utterly unaware of their insignificance. I fired the second I saw movement in the green. First shot “Bang!”, Second shot “Bang!”. The feedback pushed the flies off my body like a bunch of scared crows off a carcass. I awaited the unnecessary confirmation but there was no red mist. Instead a spray of black, then incineration. Huge flames spread like wings from its metallic frame. The light of the fires revealed its full silhouette, a seven-meter behemoth. “Reload, aim, shoot!”. I let loose two more rounds before I could make sense of the creature. The Growler didn’t seem to care, as my heralds vanished in its cindering aura. It did not move, just watched me, attentively. I emptied shell after shell into the void between its eyes, though it was hard to make out anything as the Growler’s fire covered the ground around it. The flames rushed towards me, a wave of black with a skin of red lights first submerging, then entering my matter. I clawed my way forward through the shimmering embers, ignoring it all. The pain numbed all senses, any notion of body was gone. I am a Goddess! The Growler was waiting for me in the smokes of his aura. I welcomed him gently, as he bowed in front of me on all fours. A giant, kneeling in front of his queen. Then he consumed me, and everything went dark. I opened my eyes again, could feel every growl, see their menacing waves in the liquid bed of my self-affliction. Did I… was I dreaming? No time for confusion. My instinct told me to pick up my Boomstick… First shot “Bang!”, Second shot “Bang!”. I awaited the unnecessary confirmation, then red mist. I never miss. Something felt different. My leg didn’t. I had to know, so I crawled out of the bloody pool, clawing my way through rock and stone, a little uphill past the ferns and brushes to where my prey must have fallen. The terrain flayed and cut my arms, adding new flavors of pain to my already distinguished palette. I refused to think about it. Then I saw the corpse, in a pool of red, like mine. Clinging to a boomstick, just like mine, aiming at a head, mine. First shot “Bang!”, Second shot “Bang!”. I opened my eyes again, could feel every growl, see their menacing waves in the liquid bed of my self-affliction. “This is not happening. I must’ve overdone it, drugged myself too many times. This is a bad trip.” My leg still hurt, everything did now. But I won’t surrender so easily. So, I readied my Boomstick, First shot “Bang!”, Second shot “Bang!” I did not wait for confirmation. Crawling my way back up to the spot felt worse. I could only use my arms to pull myself forward, both my legs trailing behind me like a ship that drags its anchor. I had to take breaks now, to catch my breath and to pull the thorns out of my hands. I spat on the remaining Stigmata, wiped them in the dirt and continued the climb upwards. The hill seemed to grow, now an unimportant mountain in my wake. I pulled and pushed every limb separately up the rock. The small plateau where my prey had fallen revealed itself to be a bird’s nest. Dizzy and exhausted, I crept in and found a single white egg, resting there in all its perfection. I carefully put the egg in my left hand, covered it with my right, held it close to my growling chest and tried to control my breath, slowly stabilizing, until sleep welcomed me.